Projectile Vomiting Pirate Baby in Savannah – LOOK OUT! A few weekends ago, Tracy and I decided it was time to get out of town. We really hadn’t been anywhere this summer except Atlanta. This time we decided to go with Davis in tow. The night before heading to Savannah for our spontaneous, last minute mini vacation, we headed to Wal-mart to pick up a big boy car seat for Davis. He had outgrown his and what better way to break in a new one except a 4 hour trip down south. Tracy promptly read the manual and had the seat installed with amazing speed. The next day, Friday, at lunch we set off on our adventure. Davis was a trooper. We only stopped once on the way to Savannah. He didn’t voice any complaints until the last 30 minute leg. He then began explaining that he had been in his new big boy ride long enough. He needed to stretch his legs. We ended up staying at the Springhill Suites which was modern, new and clean. It was decorated in a very sleek style – a boutique hotel feel. After checking into the hotel and resting for a bit we headed to Kim’s house to pick her up and go to dinner. We ate at this fabulous Cuban restaurant. We had pulled pork, black beans and rice and plantains. Yummo! I am craving that right now as a matter of fact. Davis was very squirmy and a tad fussy throughout our entire dinner which wasn’t really surprising since he had been stuck in the car for four hours and was now stuck in a high chair. Once dinner was done, Tracy and I headed back to the hotel in desperate need of sleep. We entered our room and began getting Davis dressed in his pirate pajamas. We changed his poopie diaper (the 4th one of the day), got his pajamas on, stood him up on the bed and he projectile vomited on his pirates, Tracy, and the decorative bed coverlet. Tracy rushed him to the sink where he threw up again. This time on Tracy’s arm, another pirate, and in the sink. We finally went to sleep and woke up Saturday morning…late. We ate lunch at Masado (sp. help me Kim) Cafe which is located in an African American church. It was such a cool find – Kim is great at locating dives and unique holes in the wall. This “cafe” had the best ribs I have ever laid my lips on. I can’t really remember the side dishes, but the ribs…Afterwards we visited the Telfair Museum of Art. There was a very large sculpture located in a very large room with stone floors and walls. 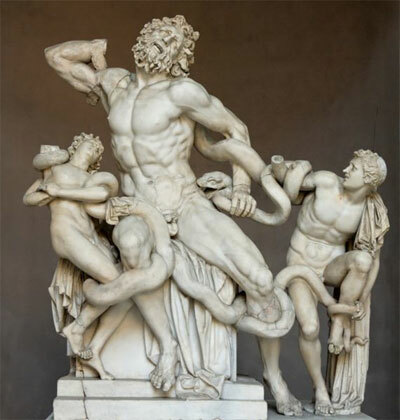 The scultpture was of a man with his two sons battle some extra large snakes. Davis and I looked at the sculpture, I waved my hand up towards it and said LOOK! The room exploded and echoed with laughter…Davis’s laughter. I waved my arm again and again belly laughs. We walked to the next statue – a much less disturbing one and I waved my arm and said LOOK! and Davis didn’t even crack a smile. We moved back to the snake fighter and Davis guffawed. Not sure what all that says about his taste in art. I guess I could be a bit concerned. After the museum, we went back to the hotel and rested a bit before heading to Kim’s friends’ house – Chris and Cheryl. We met Ashley and Josh there. We ate pizza and shared baby stories. Cheryl and Kim are both pregnant. It’s kind of nice to be on the giving side of the advice instead of the receiving. Sunday morning we woke up…late again. When Davis woke up, I proceeded to change his diaper and discovered he was covered from head to toe in SPOTS! I panicked, but didn’t call the doctor this time. We met Kim and Brett at this breakfast place and I asked Kim what she thought about the spots. She thought we should call the doctor. I dialed the number and handed the phone to Tracy. I figure that doctors probably have a littel more sympathy when dads call. And plus, I had already called one time that weekend. When Dr. Drosieko returned our call, Tracy said, “It’s the Floyd’s again.” He explained that our child was covered in spots. She repeated her earlier mantra, “If he’s peeing, pooping, eating, and doesn’t have a fever, I am not worried. Have a good vacation.” I am sure she thinks we are freaks (refer to my earlier 8 months post). After we ate breakfast, we said our good-byes, strapped Davis in his big boy seat and headed back to Myrtle Beach. all i can say is, u have a lot of freaking out ahead of you!!! Wait until he runs a real fever or gets the chicken pox, or falls on his skateboard and hits his chin on the sidewalk and needs stitches, bleeds a little or falls off the monkey bars, closes door on 2 fingers and not know if he will keep his fingers, light fixture falls and gashes the side of face and need stitches!!!!!. oh yell one more, or when a dog attacks and has to have stitches on the inside of his mouth!! WE just have to keep them covered by the BLOOD OF YESHUAH! just remember people are tough!!! glad u enjoyed the food!!! I have freaked out quite a few times myself. High fever of 105 and vomiting. Asthma attacks with high fever and not being able to breathe. The bed shaking with each breath. The fall at the skating rink and the fall at the school with broken bones. Yes, you will freak out many,many more times I dare say. Just remember, this all is part of being a mom. Freaking out is normal. You will get thru it all, I promise.